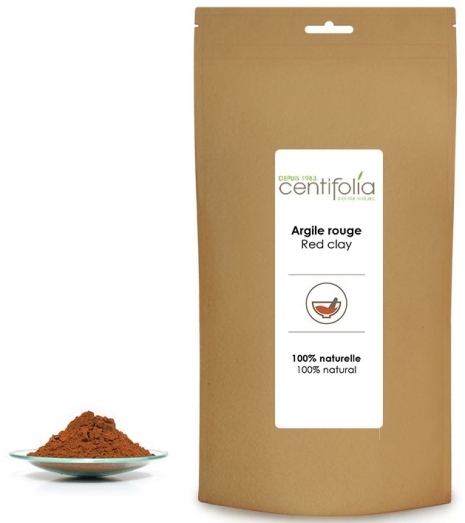 Red clay, rich in iron oxide, aids inflammation of the skin with its soothing, regenerating properties. Used as a mask, it revives and detoxifies dull, tired skin. Clays have many aplications. They can be use to prepare your own beauty products. They can serve as natural colorants. Organic Rose Hydrolat (enough to make a thick paste). Blend the organic hydrolat with the clay (using a wooden spatula). Add the organic evening primrose oi (slowly). If necessary add more organic hydrolat. Apply on face. Leave it on for 10-15 minutes. Remove the mask with organic rose hydrolat (author: Jean-François Olivier). Presentation: Sachet with zip fastening to better preserve the powder. Keep away from heat and humidity. After each use close the bag making sure it is completely sealed. 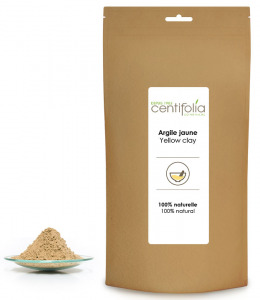 Clay is well known for its medicinal and skincare applications. Rich in minerals, it has a remarkable absorbing power. It absorbs and removes impurities and neutralize unpleasant odors. It stimulates cicatrization and skin repair.